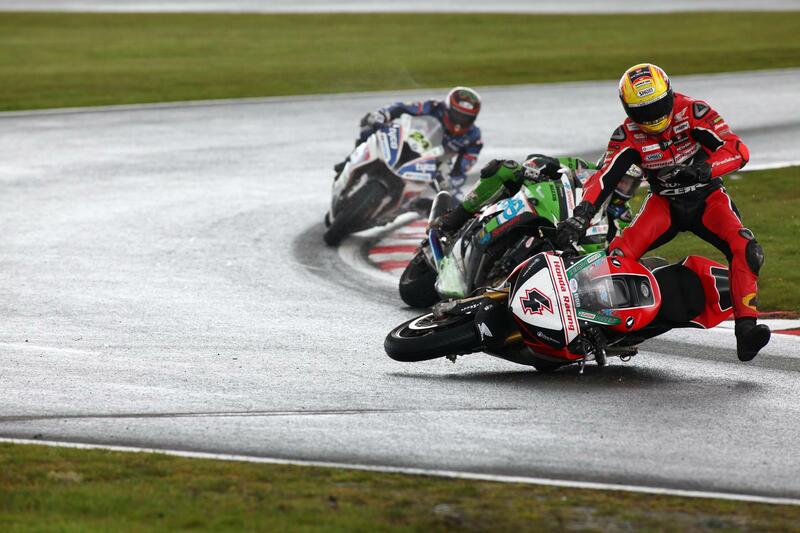 Honda Racing’s Dan Linfoot was distraught to miss out on a maiden MCE British Superbike victory after crashing out of the lead of yesterday’s opening race at Oulton Park with three laps to go. The Honda Racing rider rode a clever race to sit on the back of the leading group, before following JG Speedfit Kawasaki’s Leon Haslam through the pack to the lead. Quietly sitting behind Haslam for a while, Linfoot made his move with four laps to go and immediately began to gap the former WSB runner-up. However, his hopes of victory were cruelly taken away as the rear end came around on him, ejecting him from his Honda Fireblade with just a handful of laps remaining. “I needed a win as I think that once I get one my confidence will go up. I was that close too. I’m crying; that’s how bad I want it,” he said speaking to MCN in tears. “I was waiting behind Haslam, and I seemed to be managing my spin so much better than him, and thought ‘right, there’s four or five to go, I’m being held up, I’ll make a pass and set me own pace.’ That’s what I was doing, and I don’t know what I did wrong. It didn’t get much better for the Wetherby rider in race two, either. Opting for wet tyres in the tricky conditions, despite a strong start he began to struggle as the circuit dried, eventually pushing that little bit too hard and crashing out of the race for the second time of the day.